A race of "Cat-Women" consists of less than a dozen survivors of a 2-million-year-old civilization who live deep within a cave on the moon. Within the cave the surviving Lunar Cat-Women have managed to maintain the remnants of a breathable atmosphere that once covered the moon. They are the end product of a program of “planned genocide” to reduce oxygen consumption. The remaining air will soon be exhausted and the last of the Cat-Women species must escape if they are to survive. 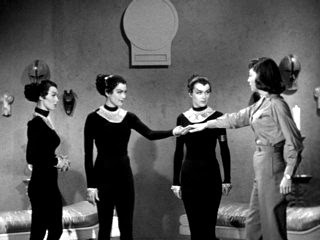 The Cat-Women plan to steal a human lunar expedition’s spaceship and return to Earth where, with their superior powers, they will assume control. 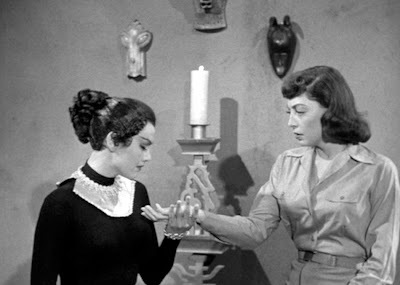 In order to fulfil their plan, the Cat-Women have used their telepathic ability to subliminally control Helen Salinger, enabling her to then gain the position of navigator on a scientific expedition that will consist of five astronauts who are to travel aboard Moon rocket 4 to the dark side of the moon. It is intended that Helen lead the expedition right to the Cat-Women’s location. While in space, the ship is hit by something which Grainger believes to be a meteor that has lodged itself in the rocket tubes. (“Something’s embedded in our rear section!” Spoken with a straight face!) In order to dislodge the meteor, the crew decides to manoeuvre the ship wildly. This succeeds but they discover some damage to the ship’s engines. (“SECTION 5” indicating problems with the atom chamber with one of the tubes damaged and an obstruction in the water line.) After some efforts at making repairs, the emergency situation is finally brought under control. Why was she vague in her response when questioned about this? Why does she act as if she recalls nothing? Why has she already chosen a site “the perfect landing place”; a choice that does not fit the mission profile since it is located on the dark side of the moon? Why is she so insistent about her choice of landing site but can’t explain why? 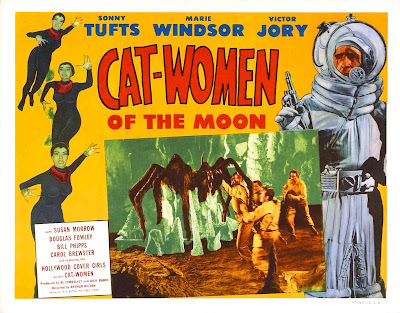 Once on the moon the Cat-Women take complete control of Helen’s mind but are unable to control the men's minds. With Helen's help, along with their own powers, abilities and feminine talents, they hope to discover the men’s “weak points," and then “take care of the rest." How could Helen have seen the cave during the landing as she claimed when she suggested that they head towards it? Another power that the Cat-Women possess is their ability to transport themselves unseen from place to place within the cave which they put to good use to steal the crew's spacesuits. After an earlier attack on the crew by large lunar arachnids, as well as from hidden cat-women attempting to take the men down individually, the Cat-Women deal directly with the human visitors and a party is put together in their subterranean city with tempting offerings of food, drink and entertainment. A suspicious and constantly glowering Kip confronts the Cat-Women's leader, Alpha after discovering the spacesuits are missing and promises are soon made to return the suits in the morning. Meanwhile the Cat-Women continue to exploit the "weak points" of the expedition’s male crew members. For example, Walt is easily charmed by Beta who feeds him stories about caverns filled with gold, so much gold in fact that no one bothers to mine it. She promises to let Walt have the gold if he agrees to take her back to Earth with him. Will the Cat-Women learn how to operate the spaceship and succeed in their mission to reach Earth? Will LOVE play a part in the success or failure of the Cat-Women’s plot? Or will the expedition manage to escape the clutches of the Cat-Women and return safely to Earth? 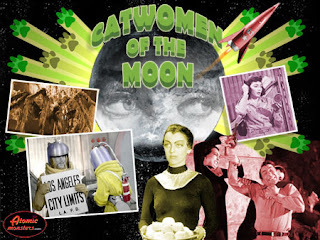 Cat-Women of the Moon is simply a movie anyone could spend time picking to pieces, but despite its many faults you can’t help but enjoy watching it. 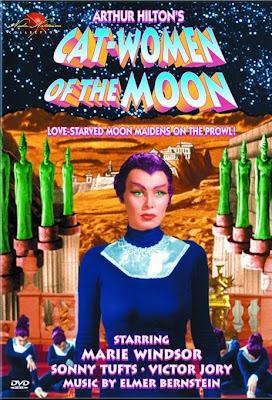 It can also be appreciated as being the first film of its kind, followed by such films as Invasion of the Star Creatures, Fire Maidens from Outer Space, Queen of Outer Space and its clone / remake, Missile to the Moon. 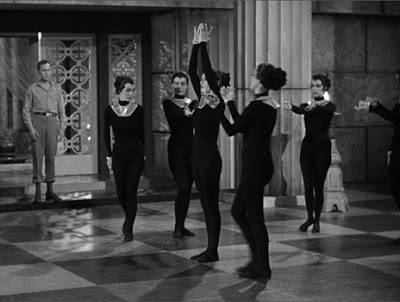 Was it just me, or did the opening to Cat-Women of the Moon really remind us of the Twilight Zone series narrator? “Why must we wait (for the barrier to be pierced)? Why not now?” I half-expected the theme tune to Twilight Zone to start up. A large part of its entertainment value lies with its nonsensical elements such as the notion that astronauts would bring cigarettes with them to the moon. This is followed by a demonstration of the temperature difference between shaded and sunny parts of moon's surface by having a cigarette thrown into a sunny part where it instantly bursts into flame! Try not to shake your head and smile! Still, the temperature differentiations are quite extreme on the moon’s surface. Apart from the suspect science, we have equally suspect set designs with mundane office chairs complete with seat belts in a spaceship. The spaceship interior itself is remarkably like the one in the film Project Moon Base made in the same year as Cat women of the Moon. It gets better with the “special effects” where far from being horrified by the giant puppet spiders, we would run the risk of expiring from spasms of laughter. Still, we feel the need to keep on watching despite (for the want of a better word), the “acting” of Sonny Tufts! And then there’s the wonderfully politically incorrect dialogue with great lines like Walt’s, "You're too smart for me, baby, I like ‘em stupid." Sure, we might cringe at watching movies like this, but we should be sophisticated enough to view them as being a part of sci-fi film history and a window through which to see the attitudes of a largely by-gone era. It’s both fascinating and funny at the same time. Perhaps part of the appeal of this and similar movies lie with the notion of being a male traveller who encounters a lost civilization consisting solely of beautiful young women clad in tight body hugging black outfits or leotards. Unfortunately the fantasy is somewhat spoiled when the male discovers it would be more than just the TV remote control and credit card that would appropriated by his newfound female companions-his very mind would be under their control! The ultimate male fear! The horror! Can anyone explain to me why three of the astronauts were wearing goldfish bowls for helmets while two others were wearing the steel helmet variety? 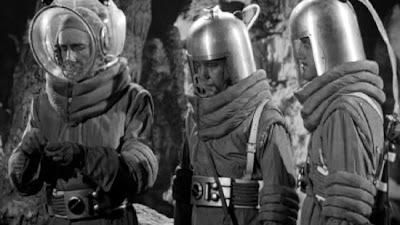 As these helmets have featured in other sci-fi films of the time, I can only imagine that they ran out of the goldfish helmets and had to scrounge around for other helmets and had to make do with two odd ones. Can anyone also tell me why when they were in the cave, the space-suited astronauts felt the need to yell and shout at one another to be heard. I can only assume that they could communicate via their radios and would be able to converse normally over some distance. It took them a while to realise that there was a breathable atmosphere in the cave. Up until then they would think they were in a vacuum and therefore yelling to be heard would have been of no use. The “weak points” that the Cat-Women are intent on exploiting, could be considered a kind of test that we as human individuals “pass” or “fail” at various times throughout our lives. For example, Walt is tempted with the promise of having more gold than he can imagine in return for providing information. Will he succumb to greed? Kip is cautious and sensible, but can suspicion and “spoiling for a fight” damage the prospects for forming meaningful personal relationships? For Laird Grainger his sense of duty is tested and his intentions are good but does everything in life have to be “done by the book?” The biggest test being faced is the one involving Doug and Lambda. Can their genuine affection for each other overcome the vices of temptation, fear, avarice, suspicion and manipulation? 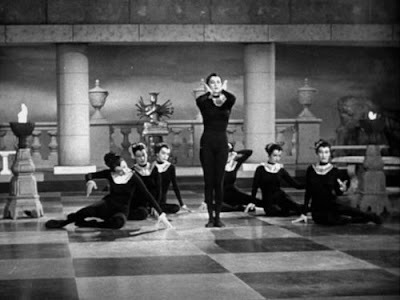 As the Cat Women have no power of control over the male crew members’ minds, it the decisions they each will make that will ultimately determine their individual and collective fate. It is certainly a dilemma for men in the modern world as we try to redefine our roles and find our purpose in a constantly changing world. With advances in science & technology, including reproductive research, it has even proposed that in the future the time may come when there will be no need for male human beings. The evil nature of the Cat-Women’s civilisation is clearly laid bare for the audience with the reference to “Eugenics.” Lambda is told in no uncertain terms that any choice of “husband” for her, along with any children she may have will be determined by the process of eugenics. There will be “no room for love.” With only eight years since the ending of the Second World War, the association in people’s minds with the medical practices of the Nazis in Germany would’ve been powerful. 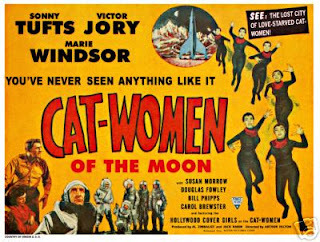 Finally, if anyone further doubts the credentials of Cat Women of the Moon, the music is by none other than Elmer Bernstein from `The Ten Commandments' fame-so there! A touch of class! 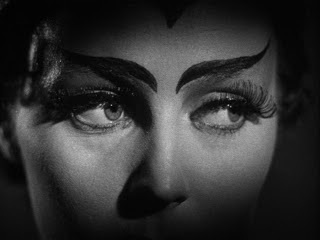 If you haven’t watched Cat-Women of the Moon, do it now…Come on….